When natural disaster strikes, such as the recent fires in Southern California or severe floods in Europe in 2002, quick assessment of the land damage can be the difference between a life saved or lost. Researchers at Columbia University's Lamont-Doherty Earth Observatory and California Institute of Technology's Jet Propulsion Laboratory recently published findings that they say prove that synthetic aperture radar (SAR) polarimetry can do a better job of assessing disaster damage than current optical remote sensing technologies, such as Landsat. SAR is an airborne or spaceborne radar tool for looking at Earth's surface and is especially beneficial when looking at land deformation. The SAR polarimetry instruments use a single antenna to detect changes in the surface materials. For example, bare surfaces produce a single "bounce" back to the antenna on the polarimetry instrument, whereas trees or other ground cover produce more random prints. SAR imaging has a clear advantage over other remote-sensing technologies: SAR instruments can obtain accurate digital images through cloud or dust cover, through darkness, rain or smoke (Geotimes, November 2003). Like other remote sensing technologies, SAR sensors send out a radio wave and collect the reflected signals for interpretation. But where it differs is that SAR uses radio waves and has its own energy beam. Scientists depend on the all-weather and day and night capabilities to provide quick natural hazards assessments. A.) SAR polarimetry data with long wavelength: Purple = bare surface, green = forest, black = other (including missing data); B.) SAR polarimetry data with short wavelength; C.) Landsat imagery: purple = landslide source area and debris apron, green = forest, dark areas in the lower half of image are lakes impounded by landslide; D.) another satellite image: light colored areas are the landslide and the vegetated slopes are dark. Courtesy ofLamont-Doherty Earth Observatory. SAR applications can be either flown on aircraft or on satellites. As of right now, SAR polarimetry instruments are only flown on aircraft, such as NASA's AIRSAR, a DC-8 airplane. 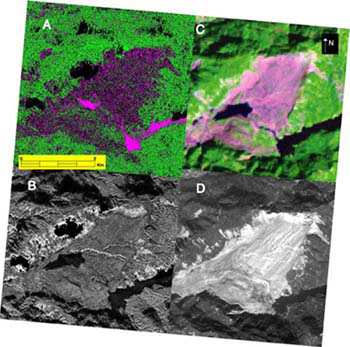 The Lamont and JPL researchers evaluated the effectiveness of SAR polarimetry by mapping a massive landslide in Taiwan that resulted from a magnitude-7.6 earthquake in 1999. The landslide slid into the Chingshuichi Valley, killing 34 people and covering about 1.3 square miles of the valley floor. Their SAR polarimetry data was taken a year after the landslide and they compared a map of that data with a map taken by Landsat imagery five months later. "We find SAR polarimetry to be equally proficient, with the critical added advantage of not needing clear skies to get an image," said Kristina Czuchlewski, a doctoral candidate at Lamont, in a press release. As reported in the October Journal of Geophysical Research, the researchers have developed a classification system for turning the data acquired by SAR polarimetry into detailed maps depicting landscape elements such as water, vegetation, rocks and elevation on a very small scale. This classification is the first step in developing maps of damaged landscapes to provide to rescue workers in a disaster. Various hazards change the radar scattering properties of the terrain, so the researchers are developing a set of algorithms for the differing hazards. They currently have developed algorithms for landslides and have almost completed a suite for wildfires. In the works, the geologists have algorithms for lava flows and floods, says Jeffrey Weissel, a geologist at Lamont, and team leader. The SAR maps could also help predict where disasters will strike next by, for example, mapping a hillside that's been denuded by fire and is at risk for landslides with the onset of rain. "We want to develop a system that can be deployed all over the world in a very short period of time, as hazards are occurring," Weissel says. He says the best way to do that is to put SAR polarimetry instruments on unmanned aircraft, especially because for the price of one satellite, they could deploy 20 to 30 unmanned planes around the world. In addition to being relatively inexpensive, Weissel says that the unmanned planes have several advantages over the DC-8s. Some unmanned aircraft have long hover times, meaning they can stay in flight over a disaster site for 40 to 60 hours  much longer than a pilot can safely stay in the air. That ability also allows the vehicles to image events that last for days, Weissel says, including volcanic eruptions, wildfires and floods. The unmanned aircraft can also be used in risky situations where it may be too dangerous to send human pilots, such as above an erupting volcano. The aircraft fly above the civil airspace, eliminating the potential for disturbing commercial flight. NASA is currently looking to retire the AIRSAR plane: These unmanned planes might be the next step.